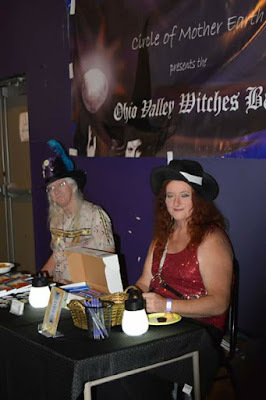 In what will probably be my last Witches's Ball post, I remembered I promised to tell all of you if I saw any/many cross dressers and/or beginning transgender women at the ball. The answer is just a couple over the course of the evening out of an estimated 150 attendees. As you can see to the left, I was afforded a great seat to sit and "people" watch. Both of the other cross dressers were very young and thin and one was dressed as a skeletal witch and the other just as a girl. One looked like she was wearing her own hair and the other had a cheap Halloween store blond knock off. Liz had a chance to make eye contact with the second who was there with a group of girls and received a shy smile in return. I couldn't make eye contact with either which was different because of all the other eye contact I made. Maybe next year they will be back!